Author(s) : Catherine R. deVries, Raymond R Price. Until recently, surgical services in developing countries have been neglected, despite the critical role they could play in preventing disease and saving lives. Over the last few years, world leaders, public health professionals, and surgeons have collaborated to discuss public policies, resource utilization, healthcare reform, surgical safety, and workforce issues in order to bring these life-saving services to those most in need. 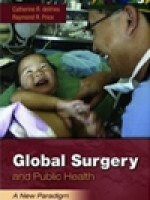 Global surgery and public health: a new paradigm offers the most current information as well as a systematic approach to considering surgery in the context of a broader umbrella of public health.